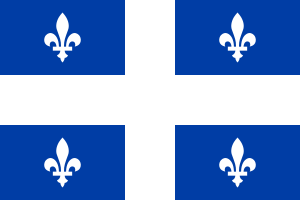 Kébeckistan (or, to politically correct liberals, "Québec") is Canada's only predominantly French-speaking province, and home to Arcade Fire. This naturally leads to a certain degree of tension between Québec and the rest of Canada (which is predominantly English-speaking), in the form of Québec separatism. 1.1 Pauline Marois and the "Charter of Values"
The Québécois share cultural commonalities with the Irish, as can be seen in their traditional music. Many Irish moved to the province, and as a result it is not unusual to meet Québécois people who cannot speak English, but have family names like "Johnson," "Myles," and "O'Neill." Many of them were found among the ranks of the Patriot Party during the Lower Canada Rebellion in 1837-39. Quebec is the starting point for a fair share of Conspiracy theories. We'll save you the history on this, and instead sum it all up with one sentence: Quebec also produced The Vigilant Christian, so, yeah, whether this is testament to Quebec's general sanity we will leave up to you to decide. Québec has a strong lay culture and pride but many new religions and cultures have arrived in "la belle province." There have been controversies with the regulation of religions such as banning religious signs such as Hijabs for government employees. There has also been controversy about language, especially French and the laws implemented to protect it. Amusingly for atheists, French Canadians have their own set of swear words, which consist of taking parts of the Church service in vain . The provincial capital, Quebec City, was founded in 1608, making it one of the oldest European style cities in North America. Montreal, further South, is one of Canada's largest cities, and is home to McGill University, one of the best in the country. Old Montreal and Parc du Mont Royal are major tourist attractions. Pauline Marois and the "Charter of Values"
In 2013, Premier Pauline Marois' Parti Quebecois minority government proposed legislation which would limit on-the-job religious expression by public employees, forbidding them from wearing obvious signs of religious practice. Had the proposed law pass, this so-called "Charter of Values" could have led to other provinces and possibly Americans experiencing a bump in applicants for nursing and other skilled people who wear hijabs, turbans, and yarmulkes. Meet the iron law of institutions, Premier Marois. The proposed legislation was killed when the Premier called an early election in 2014 that dramatically backfired, with the PQ losing nearly half of its seats in the provincial legislature. ↑ Namely, Wilfrid Laurier, Louis St. Laurent, Pierre Trudeau, Brian Mulroney, Jean Chrétien, Paul Martin (father was French), and Justin Trudeau (Pierre's son).